Noblemen and tribal leaders from the lands of Syria and their loyal subjects. Their desire to preserve their lands and acquire new riches will inspire them to join military leaders in their conquests. 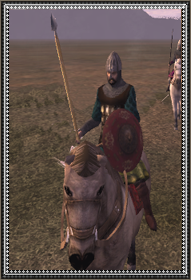 Pay them well, respect their believes, and they will provide the military leader with skillful heavy cavalry, experienced in battles in sands and deserts against infidel or enemy of the same kin.